The KingsCourt Pavingstone Systems with ArmorTec collection features five classic shapes with straight sides. The edges of the pavers in this collection are beveled, and the surface of each paver is smooth and flat. Available in a large range of square and rectangular configurations, such as the 4 x 8 Holland 2-3/8 thick; 4 x 8 Holland II 3-1/8 thick; 6 x 6, 6 x 9, 8 x 8 and 12 x 12, the pavers from the KingsCourt Collection are offered in an array of brilliant colors. 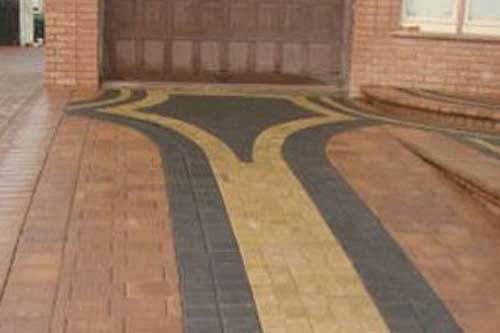 Color choices include ruby/onyx, chestnut, salmon/onyx, Sahara, ruby, salmon and other combinations, depending on each particular size paver. This collection has a variety of uses- from commercial development, to residential projects, such as walkways, patios, cityscapes, courtyards and driveways. Like all Cambridge with ArmorTec products, the purely pigmented KingsCourt Collection carries a “fade-proof” color guarantee. The pavers are “sealed” from the inside out, protecting your investment from harsh weather and conditions that may damage stones that aren’t made with ArmorTec.